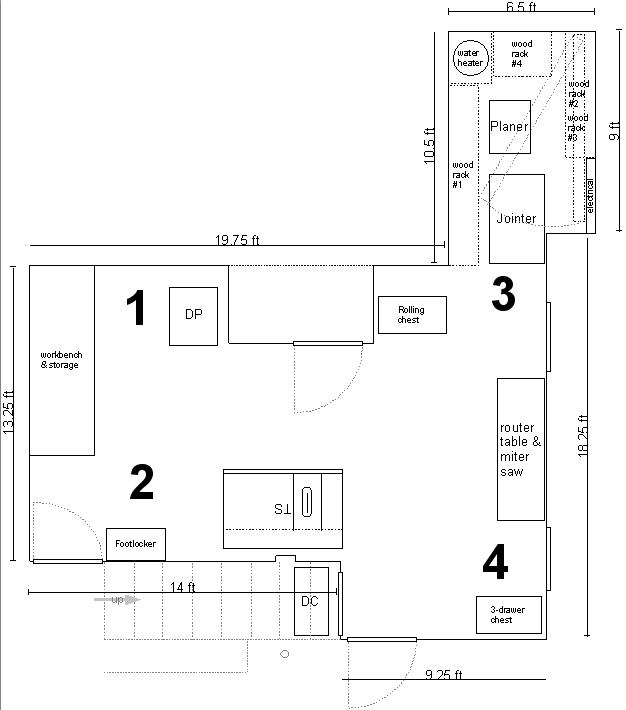 Here is the basic layout of my shop, which is in a basement (walk-out) that is shared with a garage. Corner #1 houses my main workbench. It was assembled from a neighbor's discarded kitchen cabinets. Behind the workbench is a small lumber storage rack made from scrap lumber - it currently holds ~100bf of walnut I had milled from a neighbor's downed tree. One the left end of the workbench is my bar-clamp tail vice. The shelves above it (above workbench) were assembled from shelving that originally lined the walls of my first shop (in a previous house). My auction purchase of Fine Woodworking and American Woodworker are on top, along with my collection of ShopNotes and Woodsmith. The black steel cabinet on the right wall is a $20 Harbor Freight clearance item that houses finishing supplies, glues and other chemicals. Below is my baby drill press (auction find) sitting on a wheeled cabinet/drill center ($5 garage sale fine). Small hand tools are in the red toolchest - mostly mechanics tools. 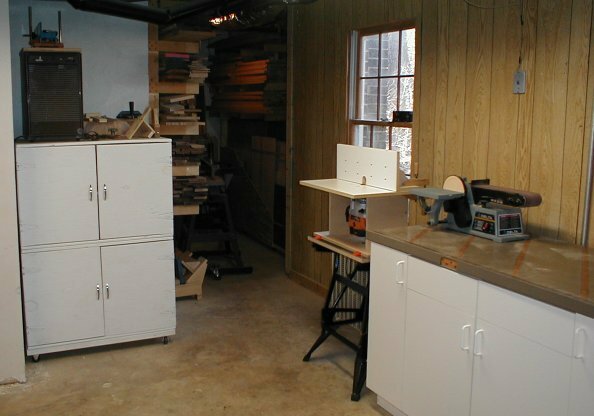 Corner #3 has some storage cabinets, a workbench and lumber storage. 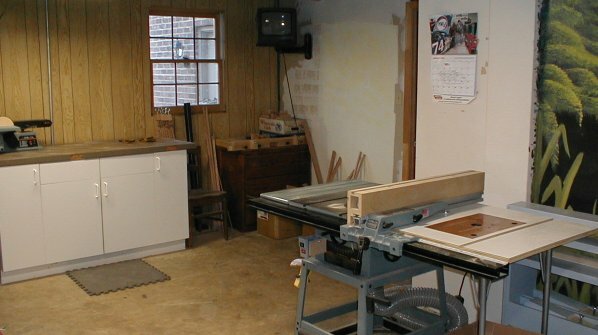 The white cabinets on the left hold tablesaw accessories, jigs and fences. 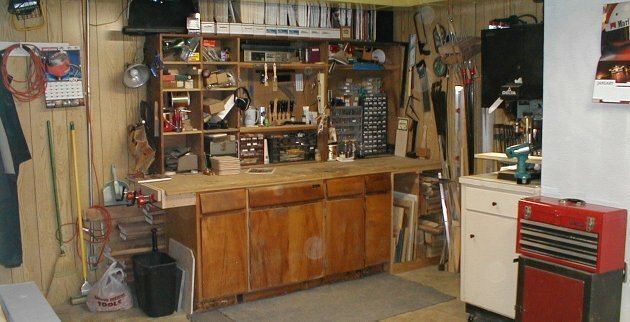 The storage cabinet on the right serves as tool storage and an assembly/finishing table - my disc/belt sander is on top. Someday, the cabinet will be moved to the right (corner #4) where it will be plumbed for a sink. 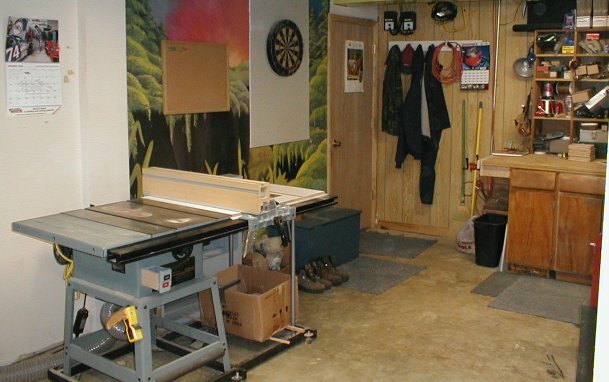 Just to the left of that cabinet is a Workmate with my newest router table. At the back is a storage area. I built lumber racks to fit the area - it holds about 800bf of oak, walnut, cherry and other assorted wood. You can just barely see the end of my Delta 6" jointer...behind it is my planer - an 80s 15" Delta clone. Corner #4 shows another view of my tablesaw (which is in the middle of the shop) and assembly table. The cabinet in the corner stores rags, router accessories and clamping guides. Outside the window is a firewood rack that doubles as a drying rack for oily rags. And of course a TV in the corner - for College Football saturdays in the shop!